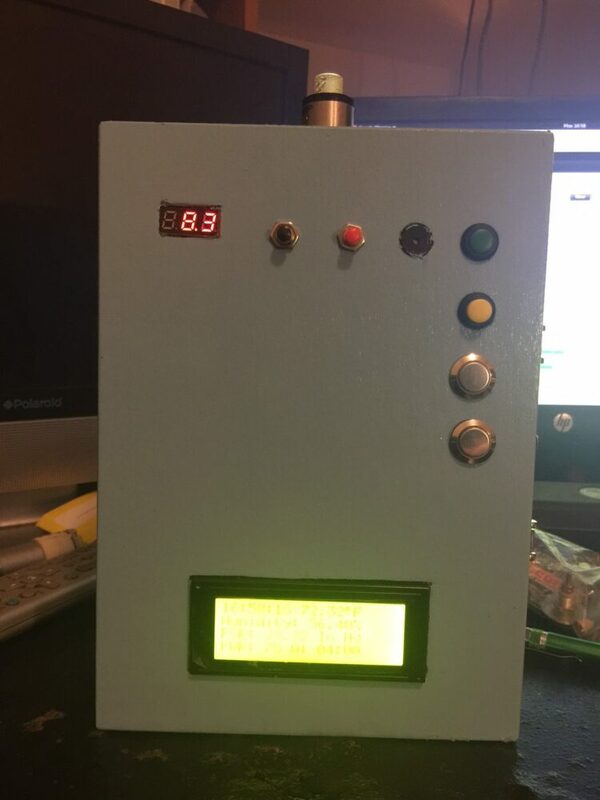 Arduino Bottom Feed Vape Mod -- built with Arduino Nano. 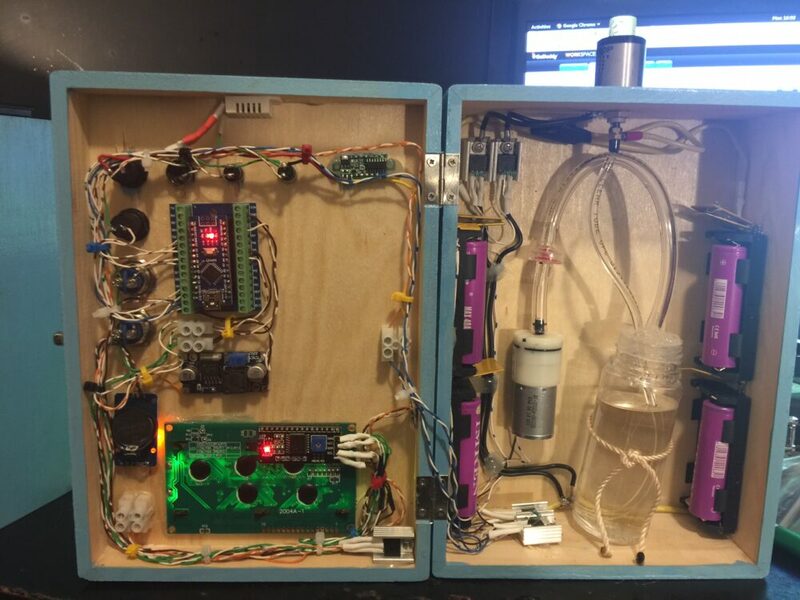 The purpose of this post is to simply show you how I built my Arduino Bottom Feed Vape Mod. If you choose to implement any of this documentation in any way, please be responsible. There are many dangers associated with using both the Lithium Batteries and the vape head. Unforeseen failures can be catastrophic! You have been warned! Previously, I showed you how to build a standard mod with wifi. The code for this box will include wifi, however, I did not add the ESP8266-01 to this box. To add this feature, simply power the ESP8266-01 from the 3.3v regulator, and connect RX to TX, TX to RX between the processor and the ESP8266. You will need to disconnect the wifi module from TX and RX, however to upload code to the processor. The parts list will be the same as the last box, with an additional 3034 mosfet, 7805 regulator, 370 aquarium air pump (6v), some tubing, a check valve, and a 120ml bottle. You will also need a bottom feed 510 connector. The one I purchased was from Varitube. I liked the Varitube connector, because it’s threads are long enough to pass through the top of the wooden box. The green button is the power button. This button supplies power to the processor, and other control components. The Yellow Button is for a 30% power boost. The red and black buttons are for selection — Raise and lower power, as well as various selections in configuration mode. Our top silver button is for the air pump. This has two operating modes. When the air pump is linked to the vape button (In configuration mode), this button will start the air pump when not vaping. When you are vaping, the air pump is started automatically, so this button will inhibit the air pump. If the air pump is “decoupled” from the vape button in the configuration menu, this button will simple start and stop the air pump at will. The second silver button is for vaping. We also use this button to enter the configuration mode when pressed 5 times within 3 seconds. Configuration mode allows the alarm and time zone to be set. You can also control the speed of the air pump, and couple the air pump to the vape button. Most of the configuration is stored to the EEPROM on board the ZS-042 real time clock module. This way, when power is cycled, or the batteries are replaced, we don’t loose the settings. Since the battery pack will put out over 8 volts, I used a 7805 regulator to bring the voltage down to 5 volts before powering the air pump. A 3034 MOSFET allows the processor to control when the air pump is energized, and it’s speed. We place pressure on the top of the 120ml bottle, and this causes the e-juice to flow up to the atomizer. A check valve at the top of the air pump prevents back flow into the air pump under certain conditions. The initial problem I had is that pressure is maintained on the 120ml bottle, which caused the atomizer to flood. I resolved this by placing a small pinhole in the top of the 120ml bottle. Pressure will bleed off the 120ml bottle when the air pump is not running. Here’s the code! I have no claims that the code is perfect, and some of it is derived from other sources such as this. You will also need the appropriate libraries installed in your Arduino IDE. // Buttons default high, and ground when pressed. // Therefore, we reverse the logic in the states. // get the milliseconds for the timers. Again… Be sure you know what you are doing. I would recommend always using protected batteries, and add extra safety features to prevent reverse polarity, and overcurrent conditions. This document is simply how I built my own box for personal use.